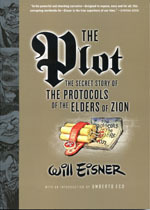 The Plot, the first graphic history to examine the infamous conspiracy and the fabrication of the Protocols of the Elders of Zion, has already received extraordinary attention around the globe. Purported to be the actual blueprint by Jewish leaders to take over the world, the Protocols, first published in 1905, is falsely believed by millions. Presenting a pageant of historical figures, including Tsar Nicholas II, Henry Ford, and Adolf Hitler, comics legend Will Eisner powerfully depicts the rise of modern antisemitic thought and dispels once and for all one of the most devasting hoaxes of the last hundred years. Born in New York in 1917, Will Eisner was the author of the first graphic novel, "A contract With God" and the legendary comic strip "The Spirit". The comic industry's top annual awards "The Eisner's", are named in his honnor.